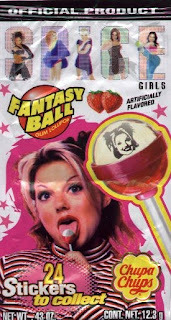 I know there may be some out there who really wanted to lick Ginger Spice's disembodied head, but I wasn't one of them. A couple of years ago the five musical atrocities got together to make a holiday commercial for the British chain Tesco...yes, the same Tesco that brought you the ginger baby Christmas card. Watching this brings two words to mind: "cruel yule."